I was wondering if you could tell us a bit about attempts by darker forces in power to psychically attack you or anyone else who is trying to get the ZetaTalk message out? In that the ZetaTalk message about the coming Pole Shift is a high priority threat to the establishment, Nancy and those who support her message have been targets. We are not talking about the casual reader or even the avid fan. We are talking about key individuals like the owner of the Pole Shift ning and his volunteer staff, or authors or bloggers who espouse the truth of what ZetaTalk has revealed. Given that there are only a few hundred psychics in the world with the talent to make an impact, and given the number of targets needing to be influenced or repressed, perhaps only a dozen individuals associated with Nancy or the Pole Shift ning have been targeted. Can the Zetas comment on the impressive UFO display over Las Vegas? What was being communicated? Bill posted the video on his UFO blog. http://www.youtube.com/v/d8VQOCIyJqI [and from another] http://www.nevada-map.org/topo-map.htm Nevada's lowest elevation is 479 feet above sea level, at the Colorado River. Los Vegas is the glitter capitol of the US, where gambling and live entertainment make this a favorite tourist destination. Even if one loses the funds they came with, they can leave with a smile as they have been entertained, or so the management hopes. Certainly, even during this the second Great Depression, they have not been at a loss for traffic, and the boom times continue at Los Vegas. We have stated that due to the hard rock from prior salt lakes in much of Nevada that the Pole Shift is not expected to change the geography of the area. 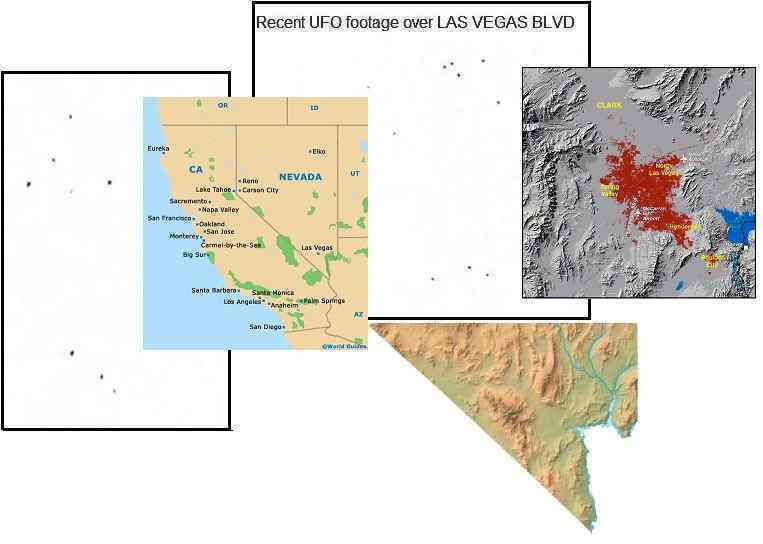 So what would put Los Vegas at risk that a UFO display that could be seen from the brightly lit streets of Los Vegas recently occurred? The great Hoover Dam is nearby, but when this breaks after the New Madrid adjustment it is assumed that it will be land down river that will be in danger. Dams do not always break by shattering such that the waters they hold back pour around the shattered dam. The Hoover Dam in particular was built so sturdily that it is unlikely to shatter. This was because it was intended to hold back an immense amount of water, and the site chosen because the rock on either side of the dam was considered impervious to erosion or crumbling. What then is likely to happen to the Hoover Dam as the pressure of the N American bow increases, as it surely will prior to the New Madrid adjustment? Spillways are openings in the dams, tubes that run through the dams ending in gates, all of which are vulnerable to being crunched and broken. A jammed gateway will hardly be unjammed easily, as that would entail dismantling the dam or some such maneuver. Jammed shut, what would the water flowing into the lake above the Hoover Dam do? It would rise, and flow into Los Vegas along the ravines that connect the two. Flood may be the last thing that residents of Los Vegas worry about, but flood may be something that may arrive suddenly, and fail to drain. I Just would love the Zetas comments on the Mexico Earth Quake, specially the seemingly amazing coincidences that happened that day: First: A drill was planned on the neighbor state of Chiapas for a 7.9 scale quake at 12:00pm, just 3 minutes before the actual Quake (the actual quake depending on who you ask was rated between 7.4 and 7.9 and yes 3 minutes of anticipation is probably all you need to evacuate and survive an earthquake). Second, the fact that Obama's Daughter was spending vacation time In Oaxaca (another neighbor state to the Guerrero State where the Earthquake epicenter occurred). All this seems too much of a coincidence for me, it seems to me that a message was sent to the people of Mexico to get ready and another message to Obama stating clearly that the Earth Changes are real (what better way to receive a message than a first-hand account from your own family?). [and from another] EarthQuake drill coincidence on CNN (Google Translated) http://mexico.cnn.com/nacional/2012/03/20/chiapas-preparaba-macrosimulacro-y-vivio-un-sismo-real The state of Chiapas was preparing Tuesday for a macrosimulacro of 7.9 degrees on the Richter scale at 12:00 hours and two minutes later there was a real earthquake with an epicenter 7.8 degrees in the southern state Guerrero. The macrosimulacro allowed the evacuation of schools and government buildings a success. But the trial scheduled at 12:00 was fulfilled in an event at 12:02 hours. [and from another] http://www.rawstory.com/rs/2012/04/02/strong-quake-hits-mexico-no-casualties-reported/ The epicenter had been hit by a 7.4-magnitude quake on March 20, which killed two people and injured 13 others. That earthquake — with its epicenter south of the Pacific resort of Acapulco — was the most powerful to hit the country since a deadly tremor in 1985, which destroyed entire neighborhoods of Mexico City and killed thousands. 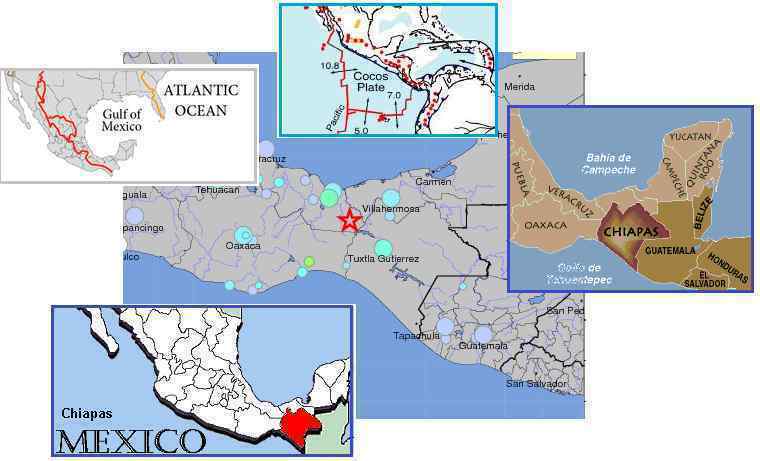 The Chiapas region of Mexico is along the border with the Cocos Plate, and thus during the S American roll, when the Caribbean Plate and those parts of the N American Plate attached to the Caribbean Plate are pushed westward, Chiapas is pushed over the Cocos Plate. As can be seen from Continental Divide maps, the Cocos Plate is pushed under this region to the point where the March 20, 2012 quake struck. This is what the Continental Divide represents, the point where subduction under the plate has pushed in the past. When the humming metal boxes were discovered on an Oregon coast we explained that the Council of Worlds had allowed the 7 of 10 plate movements to be restrained and delayed until the cover-up had been attacked. We mentioned that the discovered boxes were hardly the extent of this effort, which is ongoing worldwide and extensive. Certainly, damage from the bowing of the N American continent as the Pacific compresses and the top part of S America rolls westward has been restrained, but there is a point where restraint is no longer possible. Chiapas had reached that point. There are many strongly Service-to-Other individuals in Mexico, some in authority, and when giving the Call to assist their fellow countrymen they were told of this pending quake, and a plan was hatched. They would call an exercise and we would release the restraint, and voile perhaps thousands of lives were spared. A historically equivalent quake had indeed killed thousands. This is an example of the power of Service-to-Other teamwork, what the future can bring when those with great love in their hearts refuse to be passive but take action. Viva the Mexican heart! Do the numerous visiting aliens have to deal with the possibility that the bacteria and viruses of their world could cause illness to humans on Earth and vica versa? Much the stuff of science fiction, infections from or to creatures alien to the Earth are quite possible and as such many precautions are taken. Those races carrying germs that would be deadly to mankind or disrupt the Earth’s ecosystem are not allowed ANY contact whatsoever, not allowed in the vicinity, nor allowed in contact with the races who are visiting. Man is aware that the human body harbors many bacteria that are considered friendly, in fact necessary for functions such as digestion. All life forms have such cohabiters, and a life form cannot simply be cleansed of them. Travelers are accustomed to encountering new germs, and having an occasional bought of diarrhea because of this. The immune systems adapts and quickly includes this germ in its defenses. We take steps to reduce any debility among ourselves or our contactees. Any contact in closed quarters such as a space ship is cleansed before and after being used, and is irradiated during contact as well as subject to a mist in the air that kills germs. Do we wash our hands? We wash our entire bodies in a type of shower before and after contact. Those humans who come to live with us find they are out of sorts for a few days as they get used to the germs in our high tech cities, and we likewise have allowed ourselves to be fully exposed to human germs. San Diego Gas & Electric unveiled recently new mobile emergency command centers and new satellite communication systems in San Diego. Are city officials aware of the pending San Diego earthquake and preparing the region? [and from another] http://sdge.com/newsroom/press-releases/2012-04-02/sdge-unveils-new-tools-improve-emergency-preparedness-san-diego These new additions will provide SDG&E and San Diego County with the newest technology in field command communication, situational awareness, and crisis management, especially when traditional and cellular connections may not work. These state-of-the-art systems provide Wi-Fi connectivity and satellite communications so they can function during the most difficult conditions. SDG&E is partnering with local officials to help bring new tools to San Diego to improve overall emergency preparedness. These new facilities will not only be a new emergency resource for SDG&E, but will also be made available to the City, County, and other agencies, like the American Red Cross, should they be needed in the community. What this article presents is that San Diego is concerned about a time when “traditional and cellular connections may not work”. In other words, when land lines are down and cell phone towers are either down or without power, with generators to provide power ineffective due to the scope of the disaster. This would be an extensive earthquake, over a broad area. As with recent procedures put into place by FEMA and recent Executive Orders by Obama, such maneuvers give a glimpse into the minds of those concerned about what may be pending for the US. TPTB have allowed publishing this video in YouTube : http://www.youtube.com/watch?v=aTbksd5-Rdg allegedly an UFO refueling from energy of the Sun. What is the Zeta's take on this strange event? [and from another] This force causes moving objects on the surface of the Earth to veer to the right (with respect to the direction of travel) in the northern hemisphere, and to the left in the southern. Rather than flowing directly from areas of high pressure to low pressure, as they would on a non-rotating planet, winds and currents tend to flow to the right of this direction north of the equator, and to the left of this direction south of it. This effect is responsible for the rotation of large cyclones. Just as tornadoes occur on the surface of the Earth, due to the Earth having a rotation with consequent Coriolis effect, tornadoes occur on the surface of the Sun, which also has a rotation. These are rarely caught on film by the SOHO cameras, and always cause a stir in the general public as NASA does not make a fuss over them as they do with solar flares. Thus, the public speculates wildly. I just realized that the Michigan Crack Out Back in Menominee, MI http://www.youtube.com/watch?v=ow6W0es4a14 lines up with the sites of the Wisconsin Booms. http://poleshift.ning.com/profiles/blogs/wisconsin-mystery-booms In addition to that, the story about the missing beach in Los Frailes, Baja, CA sur Mexico has also been bothering me all day so I decided to look at the location on a map as well. At first I saw that the beach was actually an inland beach which made no sense with regard to the possibility of something like a rogue wave being the cause of the sudden loss of beachfront. I then zoomed out and saw that it looked like Los Frailes also lines up with the Wisconsin Boom / Michigan crack line! 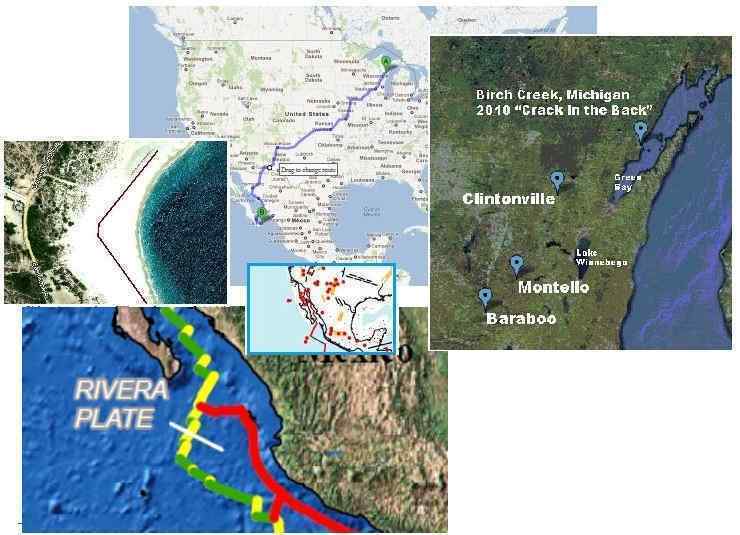 So, it seems to me that not only are we seeing the crack in Michigan opening up on a deeper level in Wisconsin, thus showing even clearer evidence of the splitting of the St. Lawrence Seaway, but we also may be seeing in Los Frailes an effect of the bowing of the North American continent on the western side. Could it be that this missing beach is actually due to the bowing of the continental plate and is actually land subsidence? [and from another] There Saturday-gone Sunday-Los Frailes facelift [Mar 28] http://www.bajafisherman.com/forum/showthread.php?972-There-Saturday-gone-Sunday-Los-Frailes-facelift Sunday morning the beach in Los Frailes disappeared - lost forever were 200 meters of beachfront by 100 meters deep. The red line is where the beach was the day before. The angler that emailed the photo in said the beach disappeared very quickly and is now a steep bank that appears to still be slowly eroding. We have described the N American bow as one where the tip of Mexico moves west while the top of the continent at Alaska and Canada remains in place. This pulls the entire continent into a bow shape which can only be relieved by the New Madrid adjustment, tearing the continent at a diagonal so that that the southwest of the US and Mexico move west and down while lands east of the Mississippi are torn away. In the meantime, the stress of the bow is pulling the St. Lawrence Seaway apart where resistance is slight. As we have mentioned, Wisconsin is pulling apart, and the rock strata there allows separation readily. It is no surprise that a crevasse on the Michigan peninsula has been joined by booming in towns to the south as rock snaps in a diagonal line toward Mexico. Mexico very recently had an adjustment at its tip, driving the tip over the Cocos Plate. The land having moved westward, adjustments moved up along the coast. The Baja coastline affected literally touches the San Andreas fault line. It is no surprise likewise for these bow adjustments to occur almost simultaneously. On March 18 Clintonville began booming. On March 20 Chiapas at the tip of Mexico adjusted. On March 20 the Clintonville booms moved down diagonally to Montello. On March 28 the Baja beach disappeared. And on April 1 the Clintonville booms moved along diagonally to Baraboo. Most definitely related!